On the solstice South African artist Faith47 will be releasing the first in a personal collectable series of zines and screen prints. The Hidden Years:: Volume One will be released online on the 21st June via the artists newly launched online webshop. The A5 zine will feature a compilation of the artists sketches from 2013 & 2014 across 80 pages. The zine is extremely limited and will be released in an edition of just 100 each of which will be signed and numbered by Faith47. The publication will be sold along with a new five colour mini print titled 'Chaos'. The set will be $85.00 incl shipping and will be on sale online at 10:00 - LA, 13:00 - NYC, 18:00 - London , 17:00 - JHB time. Have a look at the preview of the new zine in the clip below. For more of Faith47's beautiful work have a look at some of the mural she painted on a recent visit to London at the end of May. 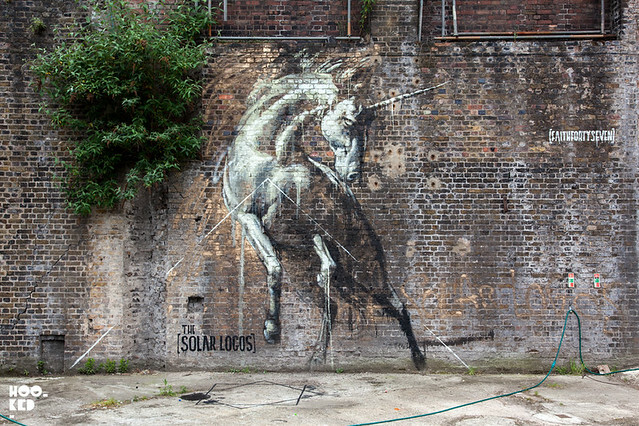 — Faith47 New London Muarls.